I love so much this fruit, wonderfull sweet and usefull. Rambutan fruit did taste good, especially if it is one meal will definitely addicted to the sweet taste and a slightly acid. In Indonesia, rambutan once found in many markets even if the traditional fruit and harvest season has arrived, a lot of vendors selling merchandise rambutan at the edges of the highway. Rambutan is a type of plant that grows in tropical regions like Indonesia, Africa, Sri Lanka, Thailand, Malaysia, the Caribbean, the Philippines, Cambodia and Central America. The plant is included in the rate-lerakan lerak (Sapindaceae) and has the Latin name Nephelium sp .. Because the shape of the outer skin of rambutan hair resembles so called rambutan. Rambutan fruit skins have hair on the outside called eksokarp. While still young, rambutan fruit skin is green and gradually turn yellow to red when ripe. Rambutans widely cultivated for its fruit is taken, but also typically used as garden plants. The content in the fruit rambutan awful lot like nutrient, starch, a type of sugar substances, amino acids, protein, iron, calcium, phosphorus, fats, enzymes and vitamin C, all of which are very good for health. While in the seeds contain a lot of fat, carbohydrates, proteins and polyphenols, the leaves lack the tannins and saponins and part tree bark contains tannin, saponin, flavonida, iron and pectic substance. In addition to the rambutan fruit tastes good and delicious, there are also benefits from plants, leaves, seeds or fruit which can cure various diseases. Due to the presence of compounds capable of treating a variety of diseases. Here are some benefits of rambutan which can be used as a medicine for health. 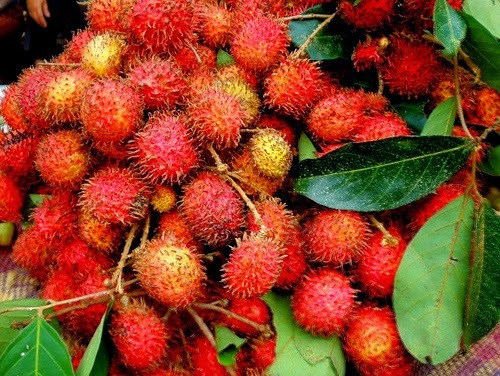 Benefits rambutan tree bark is able to treat canker sores. The benefits of rambutan fruit seeds can cure diabetes. Benefits rambutan leaf can be used for health care for the hair. The benefits of rambutan fruit skins can be used to treat fever. The benefits of rambutan fruit can cure dysentery and kill parasites in the intestines. Can you lose weight because it contains low fat, so it is good for dieters. Its content of vitamin C can increase endurance, but it also contained vitamin B3 niacin is good for our bodies. The content of iron is needed by the body to regulate oxygen levels and prevent fatigue and fatigue due to anemia. The content of phosphorus can help filter out the dirt in the kidneys and can help the growth, repair and maintenance of cell lines. And various other benefits of rambutan is good for us. Similarly, the benefits of rambutan fruit crops that can supplement the daily nutritional needs as well as medicine. And may be useful as well to make your insight.